Is snow a pest or guest? Perhaps both. This week, a pristine white blanket covered our plots, protecting them against icy frost. 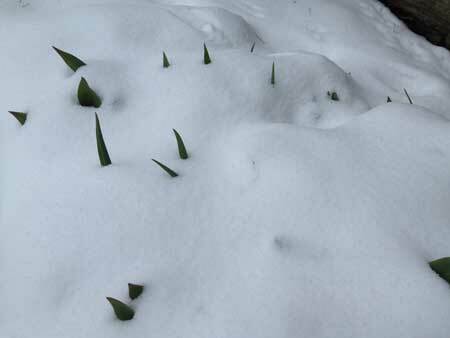 Snow protects perennial plants from harsh surface temperatures. It's good for bulbs too: garlic in particular enjoys frost and snow, using the cold as a sharp tool used to break up individual bulbs into many cloves. Evergreen plants, including rosemary and bay, can cope with a little powdery snow but should be brushed regularly so they are not broken by the weight of snow. Plot damaging insects will be set back a little by below zero temperatures. Keep your plot tidy of bricks, piles of wood etc, so that there are no warm hiding places for slugs and snails during this time. 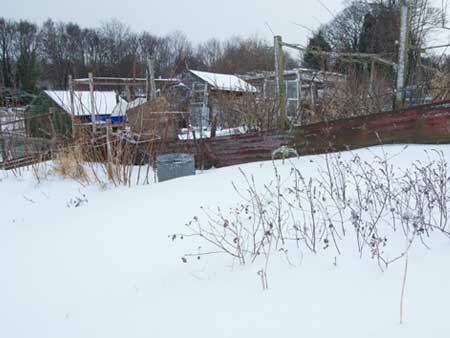 Flimsy garden structures such as fruit cages can be damaged by snow. Make sure that heavy drifts are swept off nets, which ideally should be removed and stored before winter sets in. Avoid pruning, watering or feeding plants during a particularly cold and wintery snap. Walk on grass as little as possible when it is frosty or snow covered as it is easily damaged. But of course, most of the work is best done indoors, with a selection of 2018 seed catalogues.